Red Indian Paintbrush flowers are a common sight along the trails of Rocky Mountain National Park during the summer months. 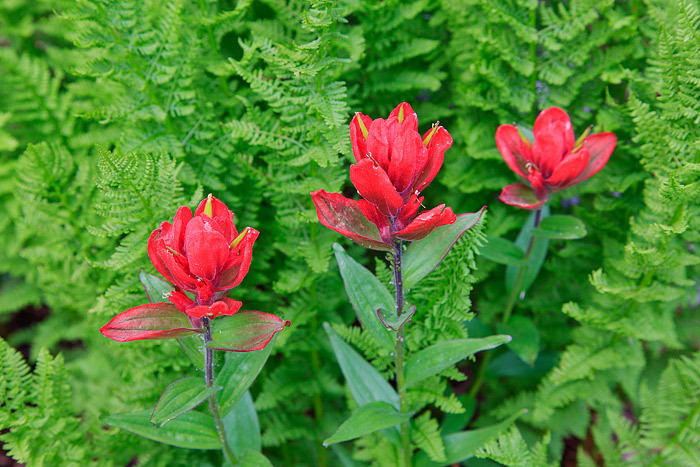 Common as they may be, few Colorado wildflowers are as beautiful as Indian Paintbrush. Nestled between the flanks of Mount Wuh and Flattop Mountain, I found these three beautiful specimens tucked in amongst some lush ferns. The contrasts of green and red helped to highlight these spectacular wildflowers. Photo © copyright by Thomas Mangan.